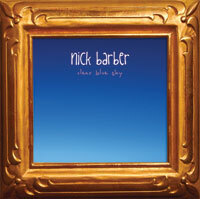 Nick Barber's exquisite, gentle and tender songs reach the heart of the matter over and over. The depth and intelligence of his lyrics, the love and beauty in his vocals and instrumentation make this an album of real music medicine, musical healing and inspiration which, once heard, you won't want to be without. <br> <br> Nick is also known as Nick Doof: a trance producer, who was instrumental in the early goa-trance scene, producing many classic tracks in collaboration with simon 'shpongle/hallucinogen' posford,T.I.P and dragonfly. A few years ago Nick started work on a collection of songs that would reflect his experiences working with healing and medicine circles around the world,and the eventual result is 'clear blue sky'. Although this acoustic album is as different as could be from his electronic music,it shares the same intention,to lift the spirit and deeply touch the heart of the listener. Nick says: "The way i see it, these songs are a completely logical progression,or parallel, to my earlier electronic music. It's always been about working with the heart for me, whether through dance or meditation,so i don't see it as much of a jump at all from one style to the other...just a change of emphasis."